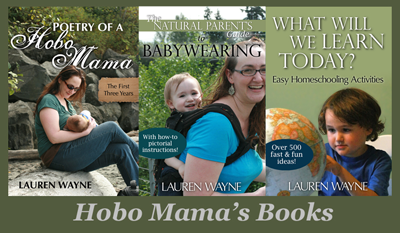 Hobo Mama: The dance of responsiveness: Subscribe to my newsletter! The dance of responsiveness: Subscribe to my newsletter! I love the attachment parenting principle of responding with sensitivity, because I think that in itself can sum up attached parenting: witnessing your child's needs and meeting them with love. One thing that's become important to me is realizing that there's no magic formula for responding with sensitivity: Our children's needs are different from another child's, and the needs change as they grow. It's a very in-the-moment process of checking back with your child and yourself to see if you're in tune right now. When Mikko was born, Sam and I learned quickly that we needed to respond quickly, and often! As a high-needs baby, Mikko needed a lot of help regulating and soothing himself: babywearing, bouncing, walking, white noise, massage, lullabies, and lots and lots of time breastfeeding. We figured out we could put him down for small periods — but only if we kept up the motion: in a bouncy seat with our foot doing the jiggling, or in a baby hammock that rocked him to sleep. When Alrik was born, we discovered a truth we'd guessed: that every baby is different. He's been much more easy-going and independent, confident to forge his own trail even in unfamiliar places. But, still, he knows he can circle back to his home base and that he'll receive the reassurance and reconnection he needs. Want to read more? Sure thing! Every month the joint newsletter from Hobo Mama, Code Name: Mama, and Natural Parents Network wings its way to inboxes all around the world, bringing compelling content like the article I wrote for the July newsletter on Responding With Sensitivity. So subscribe to our monthly e-newsletter: original articles, linked resources around the month's theme, newsletter-exclusive giveaways and deals, fun polls, and more — all delivered right to your inbox! with the article above on the rhythm of responsiveness!